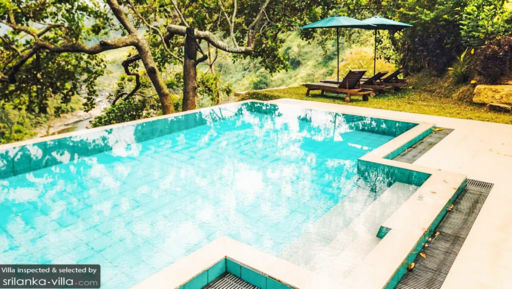 Set in an excellent vantage point atop the hills, Villa Aqua Dunhinda offers incredible vistas like no other. 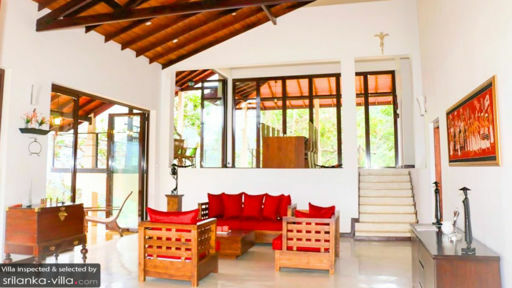 Enjoy breathtaking views over the dense Kothmale Forest, winding Mahaweli River and rolling valleys from the indoor and outdoor spaces within the compound. This hilltop home embraces tropical living by bringing the outdoor elements in; apricot-coloured rays and the cool mountain breezes flow in easily to create interiors that are bright and airy. Six guests are housed in three bedrooms, all of which feature a double bed, vanity, private en suite and balcony. Set in a sprawling compound measuring over 4,000 square metres, Villa Aqua Dunhinda offers ample outdoor spaces for communal gatherings or quiet relaxation. Start your mornings slowly with a cup of hot tea at the spacious veranda furnished with relax chairs or the upper floor observation deck. During warm, sunny afternoons, sink into the turquoise waters of the swimming pool for a refreshing dip. Come evening, round up your travelling party for sundowners as you watch the sky perform its daily sunset show. Each of the living spaces offer a feast for the senses: you’ll enjoy views out to the meandering river, and be serenaded by the soothing sounds of its flowing waters all day. Relaxation comes easy in the cosy living area, which comes outfitted with an expansive wooden dining table, a sofa set furnished with striking red cushions and colourful paintings. Service is impeccable here, so rest assured that all your holiday needs will be taken care off by the villa manager, butler and cook. A full team of housekeeping staff will take care of all your vacation needs. Your in-house chef will whip up feast after feast through your stay, and the staff will readily assist with grocery shopping. Airport pick-up, along with babysitting, laundry and massage services are available at additional cost. Located close to central Sri Lanka, Villa Aqua Dunhinda serves as a great base to explore an array of nature and cultural attractions. Take an hour’s drive out to Kandy, the country’s cultural capital. There’s much to see and do here, from taking a stroll around the scenic Kandy Lake, to visiting the renowned Temple of the Tooth and catching a Kandyan dance performance. Enjoy excellent hikes in the picturesque and serene Horton Plains National Park, located a three-hour drive from your villa. The rolling hills, cool mountain climate and extensive tea plantations of Nuwara Eliya are a two-hour drive away. We thoroughly enjoyed our stay at the beautiful Aqua Dunhinda villa. The service and scenery was nothing but perfect! Sri Lanka is a beautiful country and is fully reflected in the villa. We are very sad to leave! and will definitely come back! A big thank you to Sanjeeva and Sajith! The hospitality and the food was absolutely amazing. It's hard to pick a favorite thing about this place. The setting is incredible, with views of mountains and roaring river, up an isolated hill road far enough away from anybody else up, yet a close-enough walk or ride away. Birdsong greets you while being served coffee or tea on the veranda (and there are soaring eagles!) -- and you may need a light jacket, because it's refreshingly cool. When the doors all around are opened, the breeze flows through the house, giving it life. It's a delightful walk down a garden slope, through the tea plants and spices like cinnamon and fruit trees like avocado and jackfruit, to reach the river out front, as well as the fresh bubbling spring on the property out back. The staff, manager Sujit and his Guy Friday, make sure you always have what you need, yet always stay out of the way. Sujit also organizes day-tours like to the 3 temples around Kandy (totally worth seeing). It's also about 40 mins to get back to Kandy for a half-day (all that's needed). And he'll also take you the vegetable market and direct the cook to make your choices, Sri Lankan-style, for dinner: kale, beets, snake gourd, and all kinds of leaves for coconut salad. This is amazing for vegetarians - so rare to find this kind of opportunity while traveling. 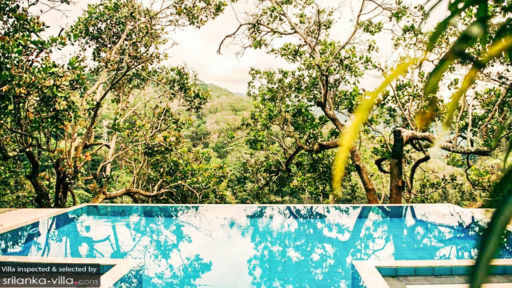 This was the best place I stayed in Sri Lanka -- really a treat! This is a fantastic place! It's the Sri Lankan home you wish you had, complete with a staff. The house is beautiful, the hilltop setting overlooking the river is stunning, and the meals are delicious. It's the perfect spot for reading, relaxing, running or walking, listening to the birds and just enjoying the scenery. It's also a great spot from which to explore Kandy and the surrounding areas, for half or whole day trips. The property is even more beautiful than the photos, and the only downside is you won't want to leave. It is a really special place that made me feel I was having a genuine Sri Lankan experience, rather than a touristy one. And Prashan is super responsive, friendly and professional. I really enjoyed my stay here and am recommending it to friends and colleagues who are contemplating trips to Sri Lanka.